In trading a breakout, there is always a hazard of a false breakout which can result in a loss. For this strategy to be successful, traders should be able to find a combination of elements that reduce the probability of a false breakout. Because no strategy can offer 100% accuracy, stop orders should always be used to limit possible losses. For our pursposes, typically high volatility currency pairs or other financial instruments of that type are recommended. They can be used with different time periods, but the 30-minute frame is our preferred one. It is essential to take the first step by locating an impulsive move to the upside or downside. When a strong move is found, it typically signals investors’ determination on a set direction. Then it is necessary to wait until a move sideways, or a consolidation, which will not decline below or above the Fibonacci retracement of 23.6, depending on the primary move. After the above two conditions are fulfilled, the next step is to establish a buy stop by several pips over the previous high. Another approach is to wait until the 30-minute candle closes, so that the move is confirmed. In this way traders minimize the risk of a fake breakout. Take a look at the EUR/AUD chart above. Once the long position is opened, it is necessary to set a stop loss order slightly below the consolidation low. 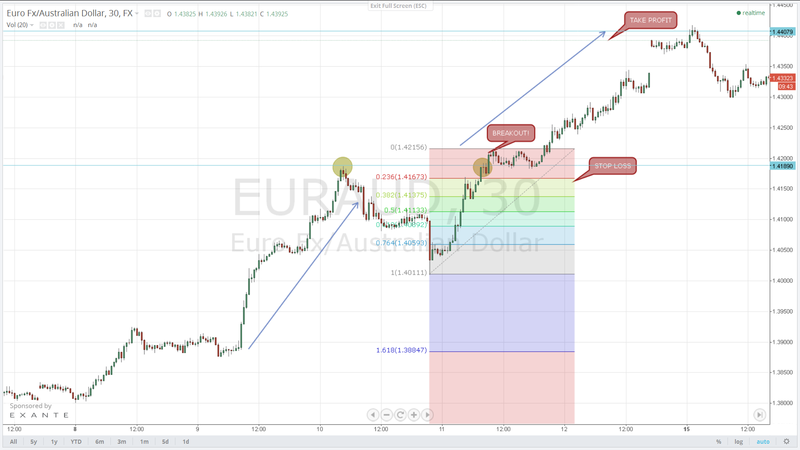 When setting the take profit order, it is a good idea the prior move projection to be taken into consideration. In this case the two rallies are almost identical in size. As a precaution, profits could be booked a bit earlier, so that you do not risk a sharp reversal, which would potentially deprive you of a part of your gain. That is an example of an upward move. The strategy can also be used with a downward move, by following the same steps and making your trades after the necessary conditions have been met.